What does it mean to be an American? Well, I'll let you decide that for yourself, but one of my favorite things about being an American is celebrating the 4th of July. I love a hot day filled with flags, food, and fireworks. The best food to enjoy on Independence Day is BBQ and the appropriate sides. 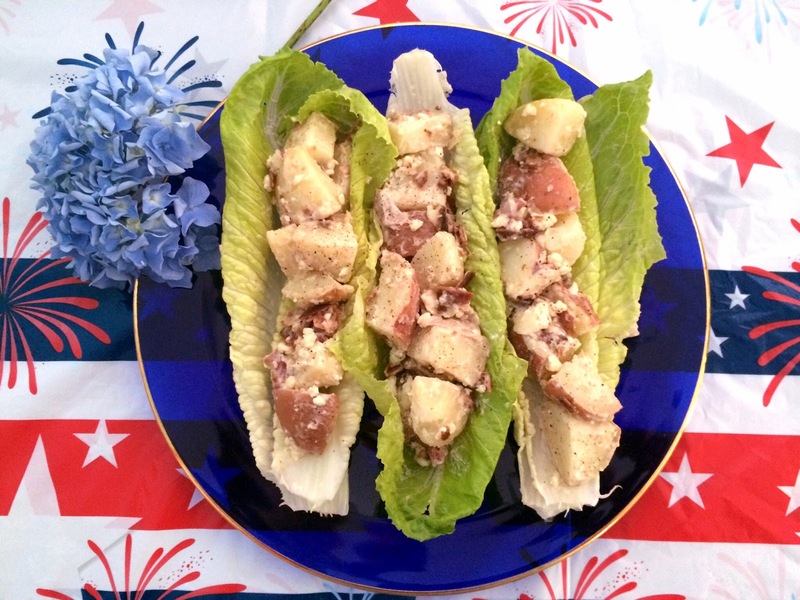 This week, I'm going to tell you about my patriotic Red, White, and Blue Cheese Potato Salad. 1. Chop the potatoes into quarters and cover with water in a large pot. Boil the potatoes over medium-high heat until tender (about 20 minutes). 2. Rinse the potatoes with cold water and place in a container in the fridge to cool. 3. While the potatoes are cooling, cook 3 strips of bacon for 3 to 4 minutes on each side and then set the bacon on a plate in the fridge to cool. Let Potatoes and bacon chill in the fridge for an hour. 4. Mix mayo with balsamic vinegar in a small bowl until well combined. 5. Crumble the bacon strips into small pieces and combine with mayo mixture. Add blue cheese crumbles and mix. 6. Chop each potato quarter in half again and put the pieces in a large bowl. Add the mayo, cheese, bacon mixture and stir lightly until the potatoes are coated. 7. Now, if you want to use cool lettuce boats that require no dishes to eat, fill a piece of romaine lettuce with your desired amount of salad, top with a sprinkle of salt and black pepper, and enjoy! If you plan to eat the salad later, place in a covered container in the fridge until needed.